What is the benefit of a liquid multivitamin compared to a capsule or tablet? The body does not need to break down a liquid extract, allowing the nutrients to be absorbed directly into our system. Tablets and capsules are often more difficult for the body to break down and absorb. Contains NO Iron - New improved exact testing for high quality supplement facts & benefits! 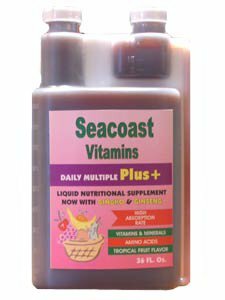 Seacoast's Liquid Daily Multi Plus has been formulated to supply you with a full spectrum of daily needs. Vitamin deficiencies are responsible for chemical imbalances within the brain, unhealthy skin, and mood irregularities. Ensure your body the vitamins and minerals it needs to keep you functioning normally. Liquid Daily Multi Plus has added ginkgo and ginseng extracts to increase blood flow and promote longevity. Any human who knows their body knows that when you have everything you need, you feel good. Include Liquid Daily Multi Plus in your diet and feel the plus. Daily Multiple Plus is a formulation of organic super-concentrated Sea Vegetables and contain natural levels of naturally occuring amino acids and trace minerals in addition to its main ingredients. Other Ingredients: Water, Sucrose, natural fruit flavor, Potassium Benzoate, Citric Acid, Potassium Sorbate (Potassium benzoate & sorbate are natural preservatives derived from soy bean). I highly recommend Liquid Daily Multi Plus if you are looking for a good multivitamin that increases energy. I can tell a difference in my energy levels when I run out! It contains vitamin B's so I have eliminated taking a B complex. I was reluctant to use a liquid multi because I was afraid of the taste. This was referred to me by a friend that has used it for several years now. I tried hers and then bought some from Seacoast Vitamins. I have been using this for about 2 months and I really do like the taste. I have not been sick with a cold or flu since taking this product. My energy level has also increased. So glad that a friend recommended this because I will continue taking it now also. Three years ago I had gastric band surgery for weight loss and lost 120 lbs. The nutritionist at the hospital recommended that I take a multi-vitamin since I wouldn't be getting vitamins from many fruits and vegetables that can't pass through the lap-band. Sometimes I still use my Centrum chewables. But these liquid multivitamins taste better. In addition They work very well with my grape protein drink and my coconut water. The daily recommended dose for potassium is 4700 mg. Liquid Daily Multi Plus contains 150 mg per oz. So I add some coconut water, which is high in potassium. I use it everyday and love how easy it is to take...great product! Liquid Daily Multi Plus is a good product easy to take and helps with energy. I can tell when I don't have it a few days. Seacoast is very good to work with for easy ordering and delivery. I discovered this product through a nutritionist who was the brother of one of my home health patients. My hair grew like wildfire and my energy level improved. I also have not been sick since beginning this product. (well except once and I was out of it). I had turned many friends onto this product who also love it and make similar claims. Great product -- I take it every day! Easy to use.. I discovered Daily Multi Plus Liquid through my chiropractor's office about 4 months ago. Since taking this supplement I've had more energy and lost 10 pounds without changing anything else about my routine. My stomache issues and inflammation in my joints are completely gone. I feel great. Costco has good variety at these same prices ($18 for 32 oz, 36oz), tried pretty much all of them. none of them taste as good as this brand. i can tell it has real vitamins cause when you drink a lot, and your urine is yellow, that means excess vitamins went through your system that the body couldnt absorb. liquid vitamins in general have 80% absorption, hard pills are around 10%/20% (i forgot). plus there's a few exotic algae in here too. This is a great product - i found it very easy to use! To stay sharp and alert and feel good all day long. This liquid vitamin is the best way to get your nutrition where evrything goes straight into your body not like pills where most end up in the toilet. This is the best liquid bitamins I have evr used and better yet the price is also fantastic. Great taste - easy to use. Great way to supplement your everyday health! quite inexpensive too, same as costco prices but 4 more ounces. the product does work, when i drink too much, yellow urine means excess vitamins and minerals leaching out. No other vitamins make me feel as good as Seacoast Liquid Daily Multi Plus. The taste is good, and the vitamins are absorbed rapidly into my system. 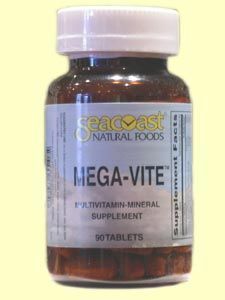 I have been using them for several years, and no other vitamins have worked like this. I was diagnosed with chronic fatigue syndrome, and these vitamins have helped restore my good health. I highly recommend them! tastes really really good. addictive in a good way almost. i do know it works because months back my urine was yellow from drinking excess vitamins. Great product! Would definately reccommend to anyone! I feel great everyday I drink the vitamins mya wife and I drink 1 ounce twice a day. I've been taking Daily Multi Plus Liquid vitamins for several months now. I could feel the difference in the liquid vs the old pill form I used to take, with in just a few days. I continue to have more energy and generally feel better. I now have enough energy to get out and walk almost daily, which also increases my energy. I've recommended this to several friends and they have gotten the same results. I luv 'em - they even taste good! Easy to take & great tasting! After a couple months of continuous use I noticed my nails were stronger and grew longer. I love this stuff! It is so easy to consume, verses a handful of capsules and pills. I take it daily along with my fish oil and one other supplement. I feel more energetic and my concentration improves. If I run out... within a week I start to feel groggy again. I highly recommend this product! This liquid vitamin is the best out there in my opinion. Question: What is the benefit of a liquid multivitamin compared to a capsule or tablet? A: The body does not need to break down a liquid extract, allowing the nutrients to be absorbed directly into our system. Many tablet and capsule multivitamins never make it past stomach acids and are released in urine. Liquid Daily Multi Plus is a unique delicious tasting formula providing essential vitamins, minerals, amino acids and enzymes in a 100% pure aloe vera juice base with ginseng, ginkgo and more. Customers rave about the boost in energy levels when using Liquid Daily! Question: Where does the seaweed used in this product originate from? Specifically, anywhere near Fukushima? A: Our sea vegetables come from Nova Scotia in Northern Canada on the eastern part of North America (far away from Japan). It is very clean and icy water, and also it is certified organic and certified kosher. Question: While you list all natural ingredients, I am interested in knowing if the b vitamins, in particular, Folic Acid and b-12, if these are natural forms or synthetic. Is your folic acid really folate? Is your b-12 - cyanocobalamin or methylcobalamin? Thank you! A: Liquid Daily Muti Plus includes vitamin K1 the natural form of vitamin K found in plants. Vitamin K1 is regarded as more absorbable and faster-working than K2. Question: Does this product help increase energy? I have been really seeing a decrease in my energy level and believe that I need to take a good multi vitamin. 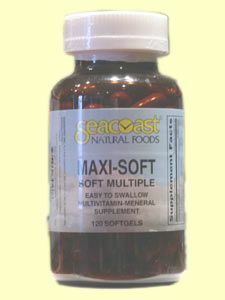 Liquid Daily Multiple is Seacoast Vitamins #1 selling multi vitamin supplement and for good reason. The number one comment we hear from customers is an increase in energy levels after using 1oz of Liquid Daily Multi each day. The number two comment is the great taste! Liquid Daily Multi is filled with energy boosting vitamins and minerals such as ginseng, ginkgo biloba, energizing amino acids, trace minerals, a complete vitamin B profile, enzymes for optimal digestion and more. Liquid Daily Multi is convenient and easy to use. Check out what our customers are saying about Seacoast Vitamins Liquid Daily Multi. Question: What flavor is this product? A: Liquid Daily multiple is our best selling liquid Multi vitamin. Our customers love this product because it is so easy to take and only once a day. This formula uses super concentrated Sea vegetables which supply the body with trace minerals and amino acids also a full spectrum of Vitamins A, B's, C, D, E, and K and others to maintain a healthy lifestyle and promote energy. It has a tropical fruit flavor.